Though the last episode of Dexter aired opposite stiff competition (the Emmys and NFL football on NBC, for example), the serial killer swan song set a ratings record for Showtime. The series finale was the most-watched original airing in Showtime history, attracting 2.8 million viewers. Including the night’s multiple airings, the tally rises to 3.3 million. The previous record-holder was Dexter’s 2012 season finale with 2.7 million initial airing viewers. What do you think? 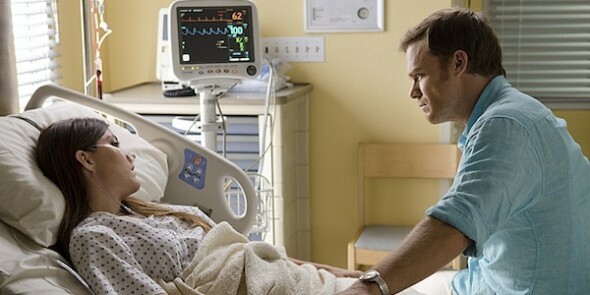 Were you watching the last episode of Dexter last night? Dexter: A Spin-Off for the Showtime Series? I feel kind of empty and disappointed. I wanted Dex to win and have a good life with Hanna and Harrison. Hopefully, he is just grieving the loss of Debra and will eventually make his way to Argentina. I would not have missed this show. I have wondered for quite some time how they were going to wrap everything up. As usual, very creatively. I was surprised, which makes me happy.